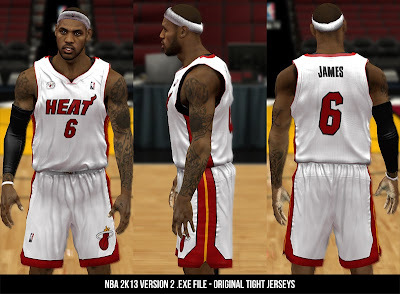 Description: This is an edited .exe for NBA 2K13 with tighter jerseys. Feature: Includes 2 versions. The version 1 is a little bit loose or baggy compared to version 2. Above is a preview of nba2k13's default jersey tightness. It's noticeable that there is a significant space between the uniform and the body, specially in the stomach part. This one fits perfectly to the shape of the players' body. Notice the big difference compared to the screenshot above. 1. First, create a backup copy of your original nba2k13.exe file just in case you want to undo it. 2. Download the patch below then extract/decompress it using any WinRAR.